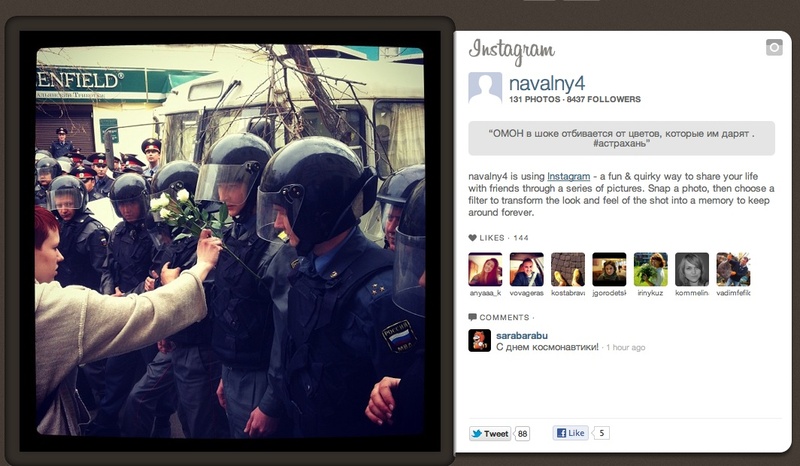 It’s a cool picture, likely conjuring up memories of other protesters fighting the power of other states with flowers. The immediate context here is an ongoing protest in Astrakhan, where a mayoral candidate has been on hunger strike to draw attention to falsification and corruption in local elections. He’s looking very thin, according to recent reports. Activists in the broader movement For Honest Elections have been working hard to draw more attention to the situation. Somehow, “fun & quirky” seems a bit inadequate here. Of course, I very much doubt the programmers and designers (slash newly-minted-billionaires?) of Instagram expected this juxtaposition: their idea was to create a fun, easy interface for photo sharing. Most likely they envisioned people snapping pics at parties, while hanging out with friends, while playing with their kids, and so on. These kinds of assumptions about users and their lives shape the way software is designed. Earlier, I talked a bit about the logistics of using digital social networks when researching actual social networks that don’t overlap–a task which is complicated by assumptions made by designers and programmers who, like Mark Zuckerburg, don’t understand why someone might need to keep different social identities distinct from one another. When you start with the assumption that your networking software will be used for “quirky fun,” you may not stop to consider what kinds of policies related to privacy, use of personal data, or anonymity and use of psuedonyms might be needed by political protesters in an authoritarian state. It’s also curious thinking about the claim that using a photo filter transforms a photo into a memory–a subject for another day, really. But I somehow doubt that fading the color on this photo played much of a role in transforming this moment into a memory for the woman giving flowers to riot police. Yesterday around 1:30 I went to Red Square to see what was to be seen. Remember, last week the entire square was closed to prevent a planned opposition protest? This week, it was open to all and sundry, even though another opposition “flash mob” was planned for 2:00. Again, the event is called “White Square”, the idea being to mob the square with white ribbons, taking over the public space to demonstrate the strength (or perhaps just existence) of the opposition. 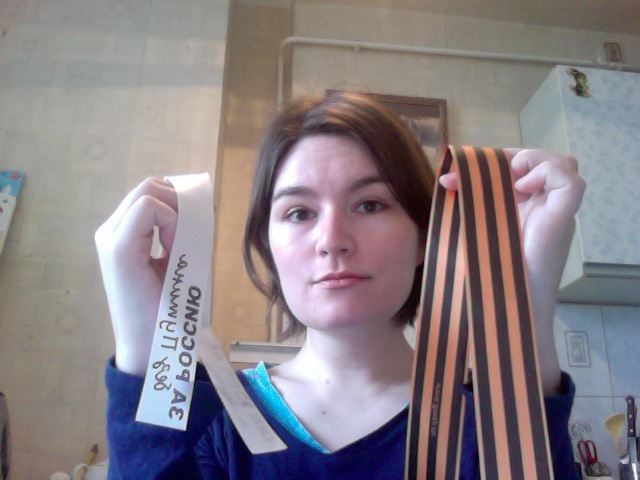 So I have some pictures, mostly not project-related. Up first: A parade down Arbat, a popular pedestrian avenue in downtown Moscow lined with shops and cafes, and usually hopping with tourists, kitsch vendors, and local youth. 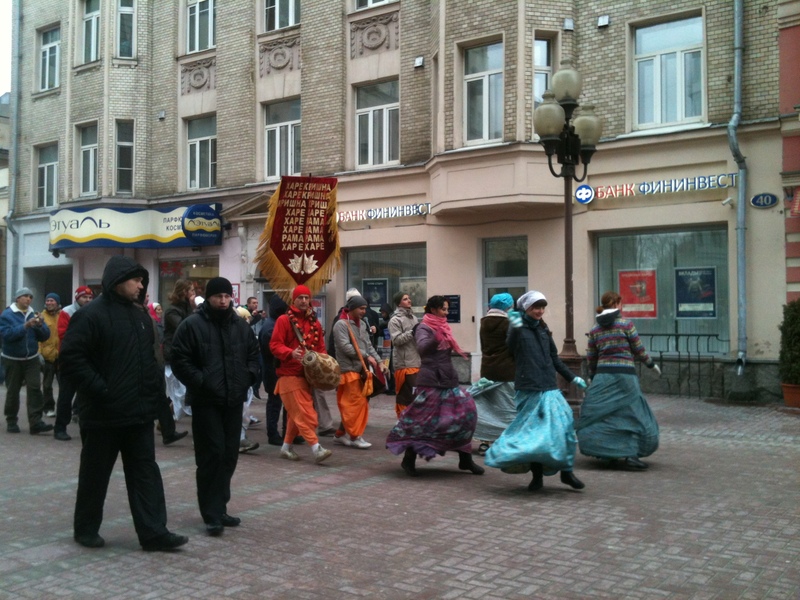 Apparently also home to Hare Krishna parades, complete with music and dancing. People standing around seemed amused and a little surprised: “Are those Hare Krishna? Really!” Many pictures were taken, and some literature was distributed.